Sunday March 20th 1881 I was busy about the house all the forenoon. Kate went to church. I read a little in the afternoon and in the evening while the girls were up stairs having a corn pop. I wrote a letter to Charlie. 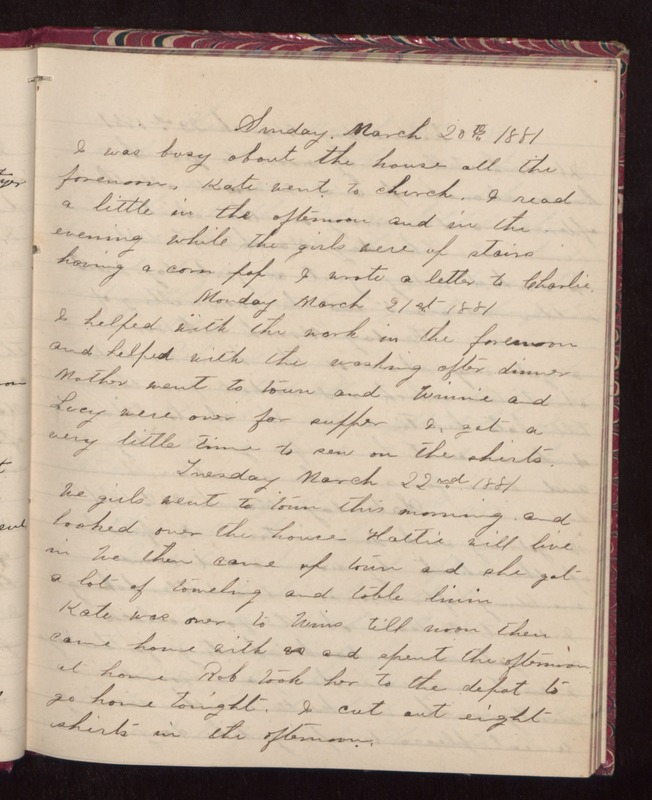 Monday March 21st 1881 I helped with the work in the forenoon and helped with the washing after dinner Mother went to town and Winnie and Lucy were over for supper I got a very little time to sew on the shirts. Tuesday March 22nd 1881 We girls went to town this morning and looked over the house Hattie will live in We then came up town and she got a lot of toweling and table linin Kate was over to Wins till noon then came home with us and spent the afternoon at home Rob took her to the depot to go home tonight. I cut out eight shirts in the afternoon.